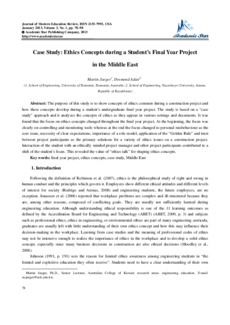 The purpose of this study is to show concepts of ethics common during a construction project and how these concepts develop during a student’s undergraduate final year project. The study is based on a "case study" approach and it analyzes the concepts of ethics as they appear in various settings and documents. It was found that the focus on ethics concepts changed throughout the final year project. At the beginning, the focus was clearly on controlling and monitoring tools whereas at the end the focus changed to personal misbehaviour as the core issue, necessity of clear expectations, importance of a role model, application of the "Golden Rule" and trust between project participants as the primary solutions for a variety of ethics issues on a construction project. Interaction of the student with an ethically minded project manager and other project participants contributed to a shift of the student’s focus. This revealed the value of "ethics talk" for shaping ethics concepts.science and arts subjects.